This entry was posted on November 12, 2015 by Jessica Anderson. Celebrate a special event for years to come with an engraved glass ornament. With Christmas just around the corner, it's time to start thinking about gifts. If you're like me, you want to get a jump on your shopping to get it over with and enjoy the rest of the season! Here at Trophies2Go we offer a number of stunning engraved gifts for your family, friends clients and colleagues. What's great about our gifts is that they are engraved for FREE and shipped directly to your door. No mall, no hassle, and more customization possible than Amazon! Here's a sampling of our newest and my favorite personalized gifts for this holiday season. 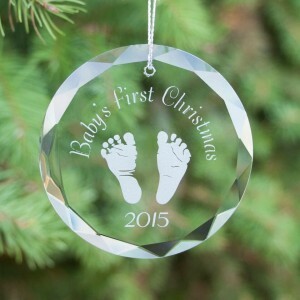 Engraved Glass Ornaments: Celebrating a First Christmas together, a special anniversary, a new baby, or a new home? Engrave a beveled glass ornament to remember the special event for years to come! Our ornaments are made of clear glass with beveled edges that twinkle and shine on a Christmas Tree! Wine Gifts: Shopping for a wine connoisseur? We offer a large selection of engraved wine gifts that any wine drinker will love! Some options include Crystal Decanters, Engraved Wine Stoppers, sets of wine glasses and engraved wine boxes. Wine boxes make beautiful corporate gifts for clients, especially when a favorite bottle of wine is added to the inside! Engraved Glasses: New to Trophies2Go, we just added elegant glassware to our line of engraved gifts. We now offer engraved wine glasses, including red, white and stem less, champagne flutes, highball glasses, beer pints and more . All glasses are deep etched with your logo for free! Perfect for corporate galas, banquets, fundraisers, and any other event where you would like branded glassware for your guests. Or personalize a set for someone special for a one-of-a-kind gift - it's sure to impress! BBQ Gifts: Do you have a barbecue expert in the house? Get them their own personalized BBQ tool set! Engrave a special message onto the box and the tools. We also have engraved cutting boards and engraved wooden spoons for your favorite griller. 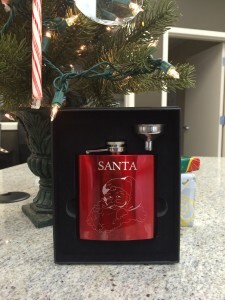 A flask gift set with a special treat inside is Santa's favorite gift! Golf Awards and Gifts: Both my husband, brother in-law and father in-law are avid golfers. If you are like me, every year you get your golfer a dozen of their favorite golf balls and a new golf glove for Christmas. This year consider presenting those balls in a special box. We offer two new golf ball boxes; a rosewood golf ball box with silver engraving or a keepsake color box that can be personalized with a photo - a cherished memory! Boxed Sets: We offer engraved boxed wine tool sets, poker chip sets, humidors, golf putters, flask sets and more. Check out our wide selection in our corporate gifts section of our website. Personalized gifts are our specialty! Forget the mall and shop at Trophies2Go for free engraving and quick turn around, just in time for your holiday celebration!